Joung (John) Y. Kim, MD, is currently an assistant professor in the Department of Ophthalmology at Emory University School of Medicine and serves on the faculty of the Emory Eye Center in the Cornea, External Disease and Refractive Surgery section. His areas of expertise include: advanced Keratoplasty techniques, the management of corneal and external eye diseases, cataract surgery, and refractive surgery. He began performing laser refractive surgery in 2000. 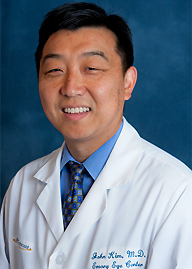 Dr. Kim is board-certified by the American Board of Ophthalmology. He is a member of the American Academy of Ophthalmology (AAO), the American Society of Cataract and Refractive Surgery, the Cornea Society and the Georgia Society of Ophthalmology. He has taught courses outside the university as well as instructing at annual AAO meetings. In 2010 he received the AAO Achievement Award for his contributions to the Academy. Dr. Kim is a frequent lecturer and has written a chapter in a widely-respected book on the most common infection following LASIK. He has written for peer-reviewed journals, contributed book chapters and presented papers at annual meetings. He has participated in research, including an innovative treatment for keratoconus, the implantable miniature telescope, and IOLs, among other clinical investigations.